Photo 26. 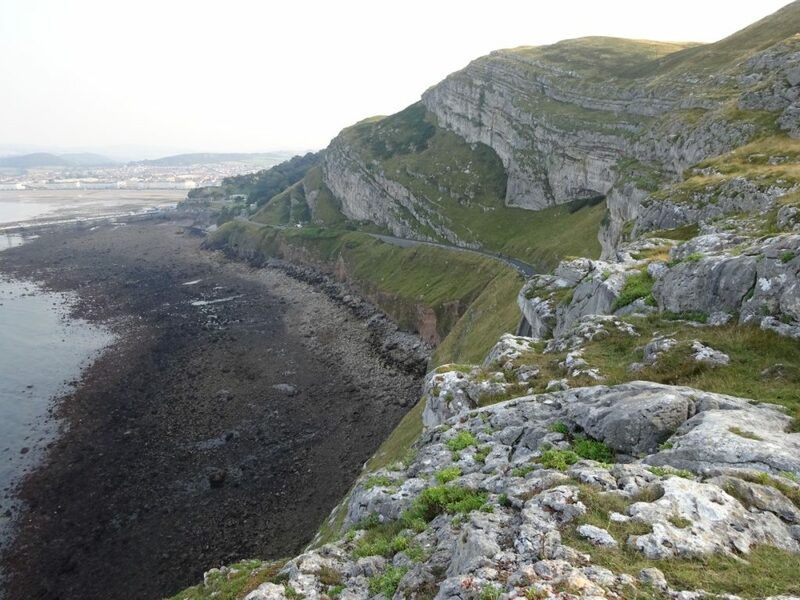 The impressive, stratified limestones of the Great Orme peninsula rise 120m/400 feet out of the sea near the North Wales resort town of Llandudno. The thick layer-cake units are composed of several sequences, with pale grey, massive, coarse grained, often bio-clastic limestone bases, and finer grained, darker, often reddish, rubbly tops. These repetitive sequences probably reflect periodic aggradation and progradation of bio-clastic carbonates (the thick, paler, more massive basal parts) during repeated phases of sea level rise (and or tectonic subsidence) whilst the rubbly, darker tops represent periods of sea level fall, sometimes with indications of paleosol formation and karstic surfaces, the latter indicating periods of exposure and erosion. The basal Llandudno Pier Dolomite, intermediate level Tollhouse Mudstone and upper sequence Craig Rofft Sandstone probably indicate periodic exposure to peritidal conditions, and periodic input of clastic sediments; all probably indicators of either close proximity to a shoreline, and/or lowered sea level. Photo 27. The east face of the Great Orme also shows the impressive sequences of ‘cyclical’ carbonates, probably caused by fluctuating sea levels and/or tectonics, although ‘auto-cyclic aggradation of bio-clastic limestones, caused by increased vertical growth towards the sea surface may also have played a part in periods of sea level rise. What is also noticeable here is tectonic folding, forming the SW-NE oriented Great Orme Syncline, produced by the end Carboniferous Hercynian Orogeny. Photo 28. The steep, bulbous mass of the Little Orme headland, to the east of Llandudno is different to the Great Orme. The massive rounded cliffs to the left are platform margin organic reef build-ups, suggesting a location on the northern, outer edge of the North Wales carbonate platform. The sub-horizontal layers to the right (Mynydd Pant) are probably back-reef platform carbonates, as seen in the next section below.